DomeOntheWeb.com: Is ISHA Dome the World's Most Incredible Dome? Is ISHA Dome the World's Most Incredible Dome? Nashvile-based Indie rocker Rockin' Rich Lynch has wanted to live in a dome home for a long time now. In the fall of 2015 he visited the biggest dome he could think of to get some ideas for his upcoming construction project. Mahima Hall reaches the sky via its Monolithic constructed top portion. 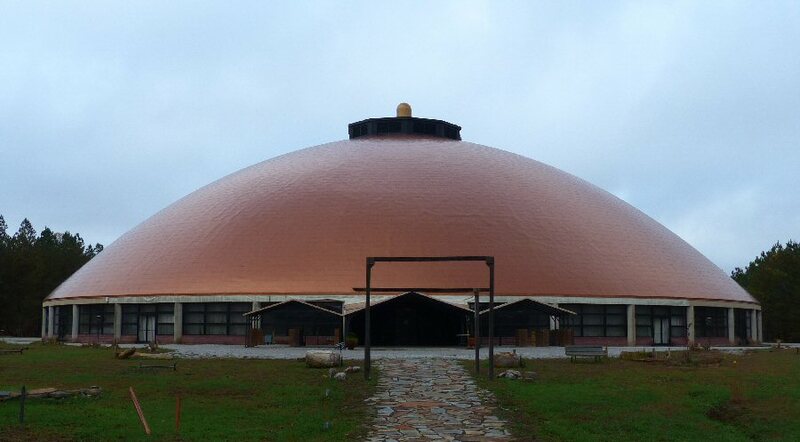 Mahima Hall is a 39,000 square foot, free-standing meditation hall at the Isha Center in McMinnville, Tennessee. The building is the largest meditation hall in the western hemisphere and it is said to be a potent sphere for self-transformation. The impressive structure is part Monolithic Dome built upon a circular base. What was most enlightening were the ear-tingling acoustics that audibly amplified whispers from the center of the 76-foot diameter round worship hall. Rich emerged from the experience with renewed purpose to build the most impressive dome that the heavens will allow. He also wants to return to Mahima Hall once again with a guitar in hand to give the dome's acoustic a proper test.